While a sniffle here or there may indicate a common cold or a seasonal allergy, many children experience much more severe symptoms that can indicate chronic allergies. As a nanny, you observe the habits and behaviors of the children in your care on a daily basis, but you may not be aware of the common allergy triggers that can cause both mild and severe allergic reactions. Common allergies, often referred to as hay fever or allergic rhinitis, affect millions of people in the United States annually. In 2010, 10% of U.S. children under the age of 17 suffered from allergic rhinitis in the previous year, according to the American Academy of Allergy Asthma and Immunology. Allergic rhinitis can cause children to have watery eyes, nasal congestion, sneezing, sinus pressure and a runny nose, even during seasons when the common cold is not all that common. Many children also have allergies to various foods, such as milk products, eggs, peanuts, soy, nuts, wheat and shellfish. According to the Food Allergy Research and Education, more than 15 million Americans have food allergies, affecting 1 in every 13 children under the age of 18 in the United States. According to Dr. Serena Anderson, family physician at Integris Family Care Memorial West in Oklahoma City, the severity of allergies varies from person to person. “The child can have blood tests performed to check for food and environmental triggers or you can have traditional allergy testing done by an allergy specialist,” she says. Allergens are lurking everywhere. In fact, according to Anderson, the most common allergens that can cause hay fever symptoms include microscopic dust mites that live in furniture and fabrics and dander for household pets. 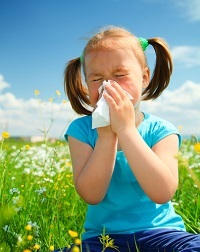 Pests and insects, pollen, mold and fungi and foods can also host allergens that may cause a child to have a reaction. A clean environment that is free from dust, mold and exposure to pollen can help a child cope better with the symptoms of allergic rhinitis. Washing bed sheets in hot water regularly, providing the child with a hypo-allergenic pillow and putting dust mite covers over mattresses also helps rid the home of these harmful triggers. Even though the fresh air may feel cool during spring and fall, open windows can trigger environmental allergies and hay fever in children. Close the windows and keep the humidity in the house below 45 degrees so the allergic child is more comfortable. If coughing, watery eyes and sneezing continues, hay fever can also be treated with medications, such as Benadryl, suggests Anderson, but it is best to discuss treatment with the child’s parents and health care provider. The best way to treat food allergies and identify triggers is to observe the child’s reactions to milk products, eggs, peanuts, wheat and shellfish. If the child has a known food allergy or a reaction, avoid these foods all together, says Anderson. In the case of a reaction, it’s crucial for nannies and caretakers to call 911 immediately with concerns of anaphylaxis. Following up with a pediatrician and allergist will help nannies stay on top of the child’s needs as well. A log of reactions and symptoms may help physicians pinpoint the child’s specific allergies and help better prepare you to provide the best care for sniffling and sneezing little ones.